Without a doubt, it is a new day for spirituality. In the popularity contest of modern life, it is religion which can’t get a date for the prom. More and more, people are declaring themselves “spiritual but not religious,” which is both progress and a problem for us. The problem with being “spiritual but not religious” is that it is a dead-end for the spiritual seeker. Without the positive ‘tools of religion,’ it can only describe a person’s point-of-view: on the one hand, a sense of wonder and personal conviction about transcendent possibilities and the numinous; on the other, a disinterest in, or dissatisfaction with known religious history, structures, and dogmas. Don’t get me wrong; I’m not criticizing people who identify themselves as “spiritual but not religious.” Anybody who feels compelled to choose spirituality over religion has, in my opinion, “chosen the better part”—to quote Jesus from the Gospels. Sometimes it seems like the only appropriate response to the religious confusion of our time. The problem arises when we are asked, or ask ourselves, “How are you ‘spiritual but not religious’?” For when we try to answer the question, we either have a difficult time explaining it, or immediately start to name activities or refer to teachings from existing religious traditions that undermine the original statement. This is because it is actually a mistake to separate religion and spirituality, as if the two were opposed to one another. The truth is that they are natural partners and cannot be separated without doing damage to the greater goal. Religion in this partnership is what you do or use to accomplish spiritual transformation. It is not something in which you must believe. It is a tool that performs a service for us, something we utilize for our own spiritual development. Unfortunately, we often find ourselves being used by the 'tool' in the end; but that’s not the fault of religion. It is up to us to gain an understanding of what it is with which we are dealing, to know what our own position is relative to our religious traditions. Obviously, if we make an idol out of religion, we become its servant and can expect to be used. But if religion is the tool that we use to gain access to the sacred, then we are in the right relative position to achieve our own ends with it. For as long as we can remember, we have been in relationship with this thing called ‘religion.’ So long in fact that we sometimes forget who created whom. We treat it like an ‘All-knowing God’ over our lives, slavishly trying to live up to its apparently divine dictates. The irony is, we created it to help us remember how to connect with the sacred, to help us achieve an experience of the ultimate reality. Even the word tells us as much; for ‘religion’ derives from the Latin re-ligare, meaning ‘to link back’ or ‘re-connect.’ It is what links us to the source or essence of our being, to all that we would remember about how to connect with that source or essence. When discussing his theory of spiritual renewal, the ever-innovative Zalman Schachter-Shalomi would sometimes borrow the Latin word, magisterium, from Catholicism to describe a religion’s collected body of knowledge or wisdom. But it is also a good way to think about religion in general, i.e., as a body of spiritual teachings and lore, rituals and techniques, carried down and growing ever-bigger through the centuries, like a slow-moving glacier carried onward by its own gravity. That is to say, religion is our collective memory of spiritual technologies and instruction manuals, the means by which we can ‘re-connect’ with the sacred dimension—but which is not itself sacred. Spirituality is an awareness of a transcendent value encompassing, permeating, or hiding just below the surface of material existence; it is the living essence of the sacred at the center of one’s life. Nevertheless, spirit is impotent without a body to carry its essential message. And this is the rub for the “spiritual but not religious.” While religion without spirituality is, as so many have come to realize, just a dead body without a soul; at the same time, spirituality without religion is a soul without a body. It can’t do anything in the world. Thus, one’s spirituality is limited to a vague sense of something ‘other,’ something ‘beyond,’ which may bring us hope, but little help. Without the structures of teaching and practice, i.e., religion, we cannot accomplish the spiritual transformation of our lives for which so many of us long. Nevertheless, the idea of being “spiritual but not religious” is a critical insight for us today. What we are really saying is that we have a sense that the two—spirituality and religion—have become divorced, that the life-spirit has left the body of religion, making it dead for us. When people began to quote Nietzsche in the late 1960s, saying, “God is dead,” what many actually meant was that religion was dead for them. But even if we acknowledge the ‘death of religion,’ we are still left with the problem of the soul without a body. This is where so many of us find ourselves today, longing for spirituality, but lacking the means of deepening our relationship with it. Although spirituality is indeed “the better part,” it is limited in what it can do for us unless we learn to pair it with a proper understanding of religion. The New Testament, The Gospel of Luke 10:42. Zalman Schachter-Shalomi and Netanel Miles-Yépez, God Hidden, Whereabouts Unknown: An Essay on the ‘Contraction’ of God in Different Jewish Paradigms, Boulder, CO: Albion-Andalus Books, 2013: 7. Friedrich Nietzsche, The Gay Science, tr. Walter Kaufmann, New York: Vintage, 1974: 181. Religion as we have known it is breaking down. The evidence is everywhere we look. It is in the despicable rhetoric and violence of politically oriented religious extremists, far and near. It is in the scandals and abuses plaguing our current ecclesiastical structures. It is in the surface tension between the ‘religious right’ and modern culture, in the growing indifference of that culture to religion, and its occasional disgust with it. And yet, it is not religion itself that is so evidently coming apart in all of these examples, but an old and outworn idea of religion as an-end-in-itself, as an idol that has—for far too long—been mistaken for its maker and its goal. It is that idol which is now being broken. Religion will go on; it is how we relate to it that will change, and must change, if we are to reclaim its genuine usefulness to us. 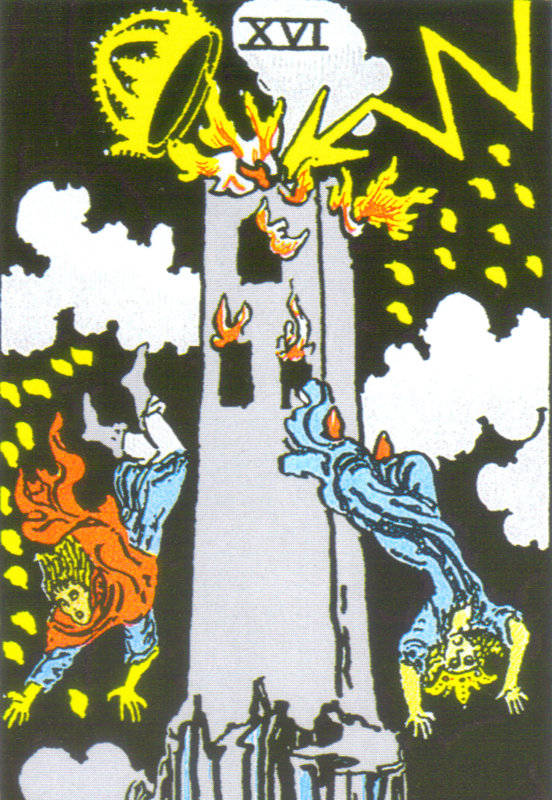 Over a century ago, the Russian philosopher, P. D. Ouspensky explored the symbolism of “The Tower” in the Tarot deck as an important metaphor for religion. The tower, he said, was begun in a time before memory, as a monument to the sacred, a reminder of the true tower in each of us, its every level representing a level to be climbed on the inside. But even before the foundations were fully laid, some of the builders began to “believe in the tower of stone they had built,” and to teach others to believe in the same. To them, the tower was itself sacred, and they soon tried to control access to all its doors and windows, and to occupy the summit and the very ‘rights to heaven,’ as they saw it. They even began to fight over these rights in their confusion. Thus, of all the people of the earth, the worshipers of the tower were the most surprised when heaven spoke from beyond its walls in the form of a lightning bolt, sending its priests sprawling to the ground, where they lay helpless amid the rubble. Now, says Ouspensky, all who look on its ruin and see its broken summit—open to heaven as it always should have been—know not to believe in the tower. Religion is a sociological construct meant to take us back to the primary experience from which it arose; it enshrines an ideal and provides one with a structured approach to spiritual awakening or transformation. That is to say, religion is what follows in the wake of the spiritual luminary’s breakthrough experience; it is what happens after Muhammad receives his revelation, or the Buddha his awakening; it is what their disciples cobble together from reports of those experiences, using them to make a ‘map’ to lead themselves and others back to the source experience. As the Buddha himself taught: religion is like a raft one makes and uses to cross a river; once you are on the other side, you needn’t carry it around on your back. It is just a means to an end, not the end itself. P. D. Ouspensky, The Symbolism of the Tarot: Philosophy of Occultism in Pictures and Numbers, tr. A. L. Pogossky, New York: Dover Publications, 1976: 48-49. “The Raft Simile” in the Pali Alagaddupama Sutta. Heard directly from Schachter-Shalomi after he gave a Yom Kippur sermon at Makom Ohr Shalom in Los Angeles, California, in which he used this formulation for the first time, ca. 2009.